A rustic, individual holiday home in beautiful Sri Lanka offering stunning views of the Indian Ocean and nearby Dalawella beach, Villa Footprints is the quintessential home away from home with vibrant colours dominating each space, lush green gardens outdoors, a private swimming pool, a ubiquitous calm, as well as sprawling views. With five bedrooms, the villa is perfectly suited for larger gatherings, especially if you’re travelling for a birthday or a private event. Close to the historical city of Galle and other areas along the coast of Sri Lanka, there is so much to do here you will never get bored! There are five bedrooms at Villa Footprints, each sporting a distinctive colour scheme to keep the bedrooms alive and welcoming! Four of the bedrooms are furnished with king-sized beds and the fifth accommodates single beds. The bedrooms are cosy and when you’re tired after a long day out about the city and the beaches, this is the ideal spot to relax in! There is ample wardrobe space in the bedrooms, a chest of drawers for additional storage, large windows with pleasant views, and one bedroom has an additional single bed as well. There are en-suite bathrooms with each bedroom equipped with all necessary amenities including natural stone interiors and walk-in showers in four bedrooms, and a circular bathtub is fitted in one bathroom! Only a mesh fence stands between you and the white, sandy beach giving you front-row seats to a splendid vista. Since you have direct access to the beach, you can stroll alongside the coastline while enjoying the ocean breeze and a view of the towering palm trees. The villa gardens are well-kempt and a swimming pool is nestled amidst verdant foliage. You can play water volleyball, or relax on the sun chairs to make the most of these resplendent green surroundings. An outdoor shower is for you to rinse-off before and after a swim! 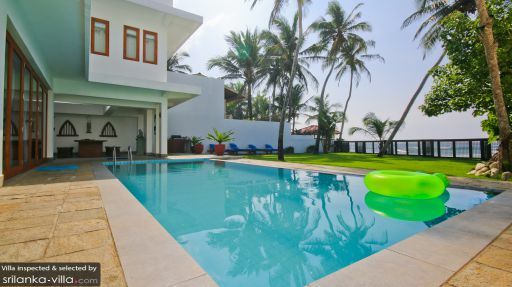 At Villa Footprints, the living area is located poolside and has been designed with an open-plan concept in mind. The glass doors open out to the pool directly and while you relax and rest on the bright blue sofas, you can enjoy endless views of the emerald gardens. The walls are done up in a beautiful aquamarine and white making this a cheerful and bright space. The air-conditioned living area is decorated with all sorts of things for a wholesome and fuller room, to give it a lived-in ambiance. 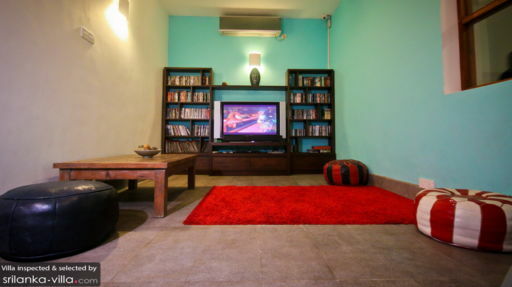 There is even a media room with a flat-screen TV, bookshelves, and comfy seating. The dining area forms part of the living space with a wooden table that can accommodate up to ten guests at the same time. Right behind the dining area is the fully-equipped kitchen with modern amenities such as dishwasher, oven, microwave, etc.! Guests have the option of dining outdoors as well, out on the lush gardens. Villa Footprints is fully-staffed with housekeeping staff, garden/pool maintenance, security, and others. Guests can opt for massages in-house or they rent out cars, boats, scooters etc. at an extra cost so they can make the most of their time here! There is an option to get the services of a personal chef as well, which can be arranged upon request. 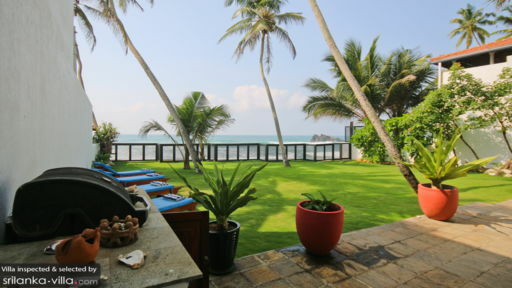 The villa is ideally on Dalawella beach and close to Mihiripenna beach, providing full access to the beautiful coastline of Sri Lanka. There is the city of Galle, teeming with Dutch architecture, and the famous Galle Fort which is a UNESCO World Heritage Site, which is another spot travellers flock to.